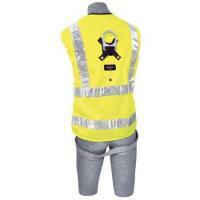 Protecta PRO Hi-Vis Jacket Fall Arrest Safety Harness AB11313HV. Hi-Vis Harness, Rear fall arrest D-ring. Full body harness with 5 points of adjustment – Legs, Shoulders and chest. Standard buckles (Pass Thru) Legs and Chest. Be seen with the High Visibility PRO jacket harness. 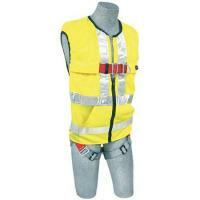 Integrated PRO harness and Hi-Vis work vest allows fast, simple and safe donning – just like putting on a jacket. Neon yellow work vests designed with 50mm wide reflective for high visibility. Lightweight polyester fabric provides breathability for enhanced comfort. D-ring location outside of vest ensuring fast and safe connections. Rear D-ring held in place with keepers preventing it from slipping into the vest. Internal mesh lining and snap attachments hold the shape of the vest and allow easy inspections of webbing and harness components. Adjustable Snap Straps hold the vest to the harness and eliminate bunching of the vest. Soft elastic edging around the arms and neck reduce chaffing for added comfort. Built-In Pockets, chest pockets with pen holder and lower pockets provide convenient and safe item storage.